Park, H. J., Wen, M. Y., Kang, C. W., and Sun, Y. X. (2017). "Development of physical pretreatment method for wood fire retardant impregnation," BioRes. 12(2), 3778-3789. To achieve a deeper and more uniform impregnation of water-soluble phosphorous-based fire retardants (WPFRs), in this work several physical pretreatment methods were developed including kerfing, boring, and the combination of both for structural square-wood posts in wooden buildings. Research was performed on three wood species, sugi (Cryptomeria japonica), larch (Larix olgensis), and Douglas fir (Pseudotsuga menziesii Franco), which are generally recognized as refractory wood species. The effects of pretreatment method on chemical uptake, chemical penetration, and mechanical properties were evaluated. The methods were compared with the incising method, a traditional method used for wood preservation. The results indicated that the pretreatments effectively increased the chemical uptake and penetration, especially in larch wood. Although the traditional incising method also increased the chemical uptake, it decreased the modulus of rupture (MOR) and compressive strength. The boring and combined method with a boring diameter less than 12 mm are recommended for WPFR wood impregnation. Wood used for structural purposes is treated with wood preservatives, fire retardants, stabilizing agents, or water repellents. In all cases, the success of wood treatment depends on depth and uniformity of distribution. One factor that affects impregnation is the treatability of wood species with these chemicals, which in turn affects product quality (Rice 1996; Lande et al. 2010). Impregnation of low-permeability timber with chemical solutions is extremely difficult. In addition, the low permeability of many wood species causes long drying times, large material losses after drying, and expensive drying processes (Comstock 1970; Flynn 1995; Chuang and Wang 2002;). Sugi (Cryptomeria japonica (L. f.) D. Don), Douglas fir (Pseudotsuga menziesii (Mirbel) Franco), and larch (Larix olgensis Henry) are categorized as extremely difficult softwood species to treat and are defined as refractory wood. Pit aspiration and inclusion of heartwood substances leads to reduced permeability of Douglas fir (Islam et al. 2007a,b; 2009, 2014). Several researchers have suggested that larch wood has poor permeability, is difficult to dry, and tends to split because it contains large amounts of resin and gum inside (Bao et al. 1984, 1999; Bao and Lu 1992). Larch wood is characterized by narrow sapwood and spacious heartwood. While the heartwood area occupies the majority of the log, the locations of bordered pit in heartwood exert a tremendous influence on the migration of moisture during the drying and impregnation periods (Kim and Park 1991; Chun and Ahmed 2006). Sugi is a low-permeable species. It has a high pit aspiration ratio up to 80% until moisture content decreases to the fiber saturation point, and then causes a significant decrease in permeability (Kumar and Morrell 1989). One of the ideas to increase the permeability of those species in a practical way is to process wood samples before impregnation to increase the accessible area of impregnation. Kerfing and boring are two methods that have been most often used to accelerate drying and reduce checking for preservative wood. To dry timbers in a short time and with few or no defects, different drying methods, chemical modifications, and physical pretreatments have been developed (Lee et al. 2012; Lee and Shin 2012, 2014). The cited authors developed a new concept material called skin-timber, in which a large hole is drilled through the center of each timber piece. To facilitate drying and preservative treatment of round timber, Evans et al. (2000) and Yeo et al. (2007) suggested the use of a center-boring technique that drills a hole from one end of the timber to the other end (Lim et al. 2013). They reported that the center-boring technique can reduce the energy use without loss of structural integrity. However, those processing treatments were only applied in wood drying to prevent drying checks. Kerfing is one pre-drying treatment that consists of cuts along the longitudinal axis, and transversal to both sides of a square post, and it has potential for significant reductions in drying time and warp (Ruddick and Ross 1979; Morrell and Newbill 1986; Rozas and Steinhagen 1996; Mallo et al. 2014). Evans et al. (2000) applied single and double kerfing, center boring, and incising to green, peeled, slash Korean pine posts to reduce checking in preservative-treatment. They reported that kerfing and center boring methods were effective in reducing the number of checks in preservative-treated posts. Kang et al. (2015) examined the effect of longitudinal kerfing on drying properties of large square Korean red pine timbers with high temperature and low humidity (HTLH) pretreatment followed by air-drying or radio-frequency/vacuum (RF/V) drying. In this study, we propose a method to improve the permeability of several refractory wood species by processing before impregnation through an increase in the contact area of impregnation, using kerfing, boring, and a combination of the pretreatments. Then, the effects of these pretreatments on permeability and penetration, as well as the influence on mechanical performance, were investigated. Three refractory wood species, sugi, larch, and Douglas fir, were selected for this study. The densities of sugi, larch, and Douglas fir were 0.34, 0.51, and 0.45 g/cm3, respectively. For each species, small samples of dimensions 30 mm (radial) × 30 mm (tangential) × 500 mm (longitudinal) were purchased from Happy Home Wood Tech. Co., Ltd. (Mokpo City, Korea). Wood samples were dried to approximately 8% to 12% moisture content and sorted to exclude those with visible cracks and knots. The heartwood ratio of the sugi specimens was measured as 90%, and it was 70% for Douglas fir and 100% for larch. The main components of the water-soluble fire retardant solution were ammonium phosphate polymer (APP), guanyl, urea phosphate (GUP), phosphonic acid, and a minor amount of additives, with a 25 % concentration of the fire retardant, a specific gravity of 1.13 (20 ± 2 °C), and a pH of 7.6(20 ± 2 °C). (2) Incising: Processing was conducted at a wood factory with the common pattern used for preserving wood products. The hole frequency used was approximately 6600 hole/m2; each hole was 13 mm long and 3 mm deep. At width direction, the hole distance was 8 mm. The four sides of each sample were incised simultaneously in the incising machine. (3) Kerfing: Samples 30×30×500 mm (radial×tangential×longitudinal) in size were sawed at the center of each side to a 5 mm depth with a width of 3.5 mm through the entire length. (4) Boring: Samples 30×30×500 mm in size were center-bored with holes 6, 8, 10, or 12 mm in diameter and at a depth of 1/4 of the length from each cross side. (5) Boring and kerfing combination: Using the boring samples, kerfing was conducted with the same pattern as for samples 30×30×500 mm in size. C: Control; I: Incising; K: Kerfing; B-6, -8, -10, and -12: Boring method 6, 8, 10, and 12 mm in diameter, respectively; BK-6, -8, -10, and -12: Boring and kerfing combination method 6, 8, 10, and 12 mm in diameter. From the samples of size 30×30×500 mm, 10 samples were prepared for each method, and 110 specimens in total for each species were tested for modulus of rupture (MOR) by Universal Testing Machine (AGS-10 KN, Shimazu Corporation, Kyoto, Japan) according to the KSF 2208 (2004) test method. The 30×30×60 mm samples were prepared for compressive strength examinations and were tested according to KSF 2206 (2004). From the samples 30×30×500 mm in size, five replicates for each method and 55 samples in total for each wood species were prepared. A water-soluble phosphorous-based fire retardant (WPFR) solution, which was prepared in the lab, was mixed with blue ink before impregnation to facilitate the observation of penetration and distribution. Specimens were vacuumed at -0.098 MPa for 5 min, and a pressure of 15 kgf/cm2 was applied for 1 h. Before and after impregnation, the specimens were weighed, and the uptake was calculated. After impregnation, the samples were air dried for two weeks and then dried at 60 °C to a moisture content of 12%. Then, specimens were cut into small samples with an average interval length of 5 cm for the observation for penetration and distribution. The mechanical data were analyzed using the statistical software IBM SPSS Statistics (SPSS 19.0, New York, United States). 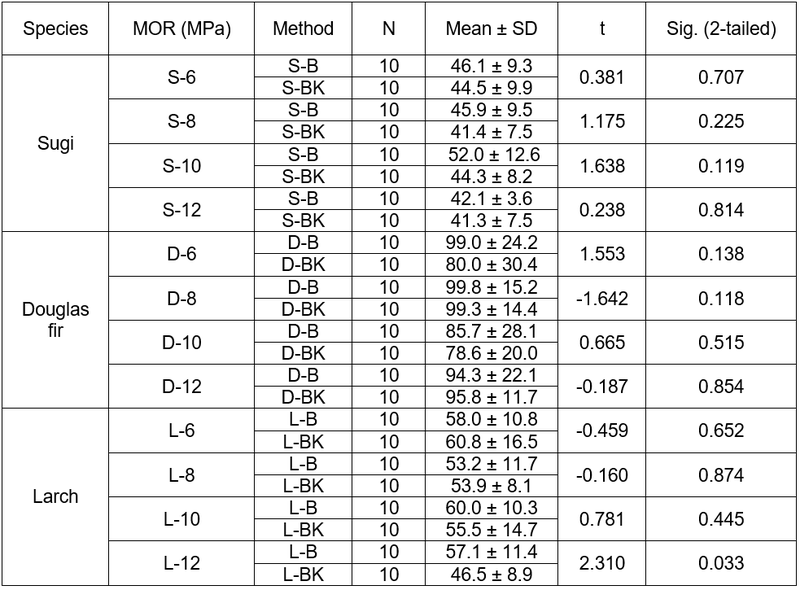 To determine whether a significant difference in mechanical properties existed among different method, the MOR data and compressive strength were analyzed using one-way ANOVA. To compare and evaluate the difference between the boring method and the combination method, the independent t-test was conducted at a 95% level using MOR data. The chemical uptakes of sugi, Douglas fir, and larch samples with dimensions of 30×30×500 mm are presented in Fig. 1. The uptake of sugi was the highest among the three wood species, and the average chemical uptake of each method exceeded 0.53 g/cm3. The range of uptake of Douglas fir was from 0.17 to 0.40 g/cm3, and the uptake of larch was the lowest, ranging from 0.16 to 0.30 g/cm3. In sugi, all methods studied increased the chemical uptake slightly by 4% to 22%, which may be attributed to the intrinsically better penetration and higher absorption of sugi species. However, in Douglas fir, it was difficult to determine the trend with increasing the diameter of boring. This might be attributed to the differences in sapwood and heartwood permeability, making the improvement by the method less prominent and even offset by the difference between heartwood and sapwood. The boring and kerfing combination method including BK-8, BK-10, and BK-12 increased the uptake by 46% to 76%. 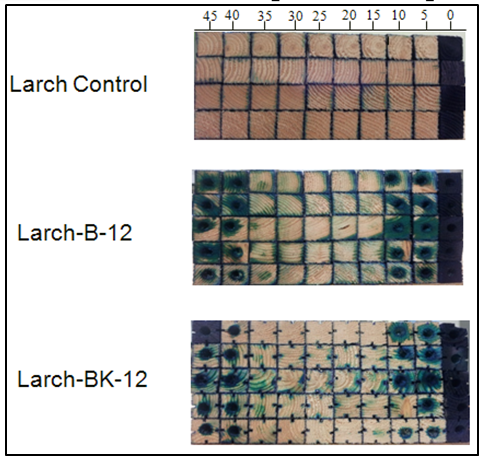 In the case of larch, when compared with the control, the boring method treatment including B-6, B-8, B-10, and B-12 increased the uptake by 42% to 71%; the boring and kerfing combination method including BK-6, BK-8, BK-10, and BK-12 increased the chemical uptake by 49% to 83%, which is slightly higher than the boring method. These findings indicate that all methods effectively improved the permeability of larch; this is possibly attributed to its poor permeability, making even slight improvements very noticeable. 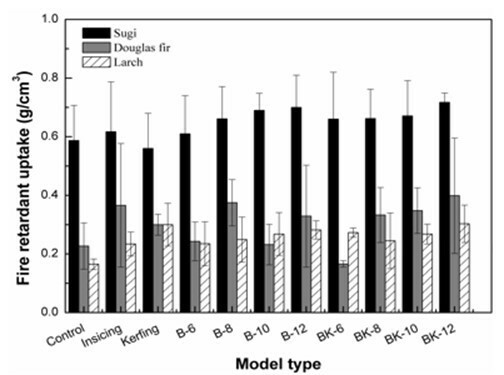 Generally, regarding the effect of the various method patterns on chemical uptake, the kerfing method increased the uptake of 5.1%, 61%, and 42% for sugi, Douglas fir, and larch, respectively. The BK-12 method increased the uptake of larch most by 83.6%, followed by Douglas fir 75%, and sugi 22%. Therefore, BK-12 is the recommended method for all tree wood species. The morphology of penetration on the cross section of wood sample is shown in Fig. 2. With more than 0.53 g/cm3 chemical uptake, the solution penetrated almost 100% into each cross sections of sugi cut from samples at 5 cm length intervals, and there was no difference found among various methods. Regarding Douglas fir, because of the noticeable discrepancy between heartwood and sapwood, determining and distinguishing the difference in penetrations among various methods were difficult. In the case of larch, the boring and combination method increased the penetration area, which resulted from the enlarged contact area of chemical solution and wood due to the pretreatment processes. Compared with larch controls, L-BK-12 and L-B-12 samples demonstrated deeper penetration into the wood, from the outer surface and the surface of boring and kerfing. The penetration reached a depth of 15 cm from the edge of wood samples. In contrast, the penetration in the control samples only occurred slightly from the outer surfaces. ANOVA results showed that the differences (P < 0.05) between sample groups were significant. Duncan’s multiple range test was used to determine the differences between MOR mean values at the prescribed level of α = 0.5. The Duncan test results of sugi, Douglas fir, and larch are shown in Tables 1 to 3 and the MOR values of all methods are presented in Fig. 3. 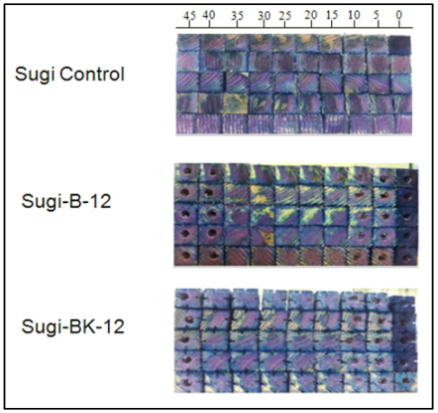 For sugi, the incising and B-10 method were significantly different from the other method. The MOR value of the incising method was the lowest, indicating a negative effect on MOR. This might be due to the high compression pressure of the incising machine during processing, which would have caused more serious damage on the surfaces of the four sides. However, the MOR of B-10 was higher than that of the controls, suggesting that the boring method does not affect the MOR of sugi. 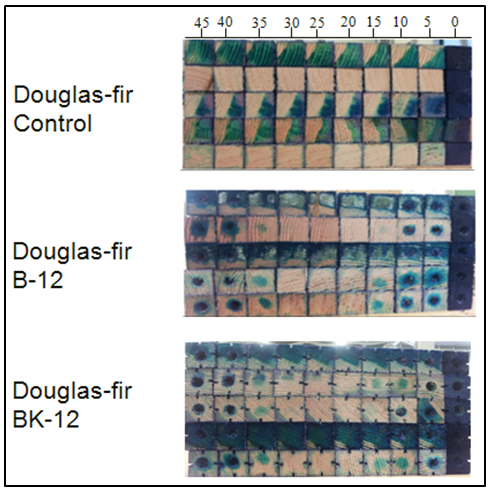 In the case of Douglas fir, as shown in Table 2, compared with the incising method, the kerfing method presented an MOR that was significantly decreased by 33.6% compared with that of the controls. The other method did not display any significant differences from each other, indicating that the other method did not negatively affect the MOR strength compared with the controls. In the case of larch, the incising and the BK-12 method significantly differed from the other method. Compared with controls, the incising and BK-12 method presented a decreased MOR, while the other method had no negative effect on MOR values. The BK-12 method displayed the lowest MOR value, which might be attributed to the greatest extent of processing due to the combination of kerfing and boring processes at the largest diameter size of 12 mm. To further investigate the difference between boring and combination method, the independent t-test was conducted. The results are shown in Table 4. No significant difference was found between boring and combination method in sugi and Douglas fir samples, which was in agreement with the statement above. In the case of larch, a significant difference was only found between B-12 and BK-12 method. This was also in agreement with the Duncan test results; in addition to incising, the BK-12 also significantly decreased the MOR value of larch by 26.4% compared with that of the controls. Based on the discussion above, the control, incising, kerfing, boring, and combination method with 12-mm diameter were selected for compressive strength analysis, and the results are shown in Fig. 4. For sugi, the compressive strength of control method significantly differed from the other method. The combination method presented a compressive strength that was decreased by approximately 36.5%, and incising, boring, and kerfing methods demonstrated decreases of 31.3%, 23.4%, and 14.3%, respectively. In larch, the combination method was significantly different from the control method and indicated decreased compressive strength by 13.3%. For Douglas fir, based on one-way ANOVA analysis, no significant difference was observed between the groups (P > 0.05), indicating that the pretreatment method did not affect the compressive strengths of Douglas fir. 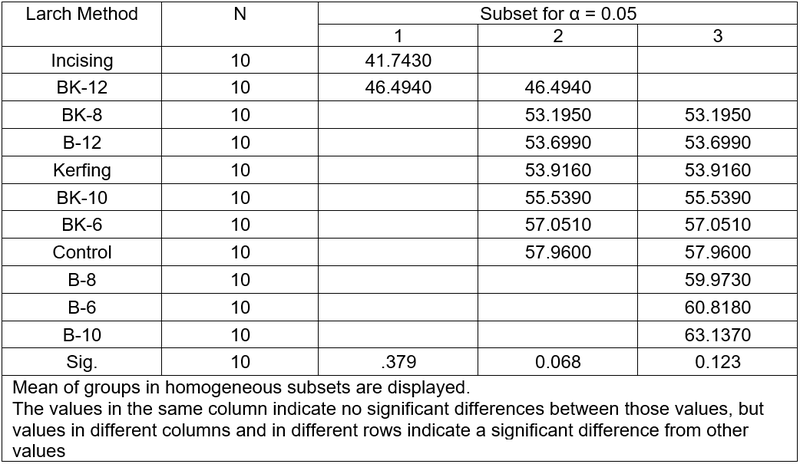 Therefore, the Duncan analysis was conducted only on sugi and larch, as shown in Tables 5 and 6. The method developed in the present study increased the chemical uptake of sugi and larch wood compared with the controls. In particular, the B-K-12 method significantly increased the chemical uptake of all three wood species. Additionally, the physical pretreatment most effectively increased the chemical uptake of larch. Regarding penetration determination, boring and combination methods improved the penetration area of larch and Douglas fir, particularly with increased boring diameter. Based on ANOVA analysis of MOR, the incising method, the common method used in factories, significantly decreased the MOR of sugi and larch. According to Duncan multiple testing, in addition to the incising method of sugi and the kerfing method of Douglas fir, no significant differences among the controls, boring, and combination methods were observed in the three wood species, indicating that the method did not negatively affect the MOR values of wood. However, boring and combination methods using a 12-mm-diameter bore (the largest boring size) decreased the compressive strength. Therefore, after comprehensive evaluations of chemical uptake, penetration, and mechanical strength, the boring and combination methods with a boring diameter less than 12 mm are recommended. This paper was supported by research funds of Chonbuk National University in 2015. Also, thanks are expressed for the support of “Wood Material Science and Engineering Key Laboratory of Jilin Province Open Fund Project,” and “Doctoral Scientific Research Foundation of Beihua University,” project No. 101416034. Bao, F., and Lu, J. (1992). “Research on the controllable principle of wood permeability,” Scientia Silvae Sinicae 7(4), 336-341. Bao, F., Tan, O., and Chang, X. (1984). “Fluid permeability in wood and forest affection on it,” Scientia Silvae Sinicae 20(3), 277-290. Bao, F., Lu, J., and Avramidis, S. (1999). “On the permeability of main wood species in China,” Holzforschung 53(4), 350-354. Comstock, G. L. (1970). “Directional permeability of softwoods,” Wood Fiber Sci. 1(4), 283-289. Evans, P. D., Wingate, H. R., and Barry, S. C. (2000). “The effects of different kerfing and center-boring treatments on the checking of ACQ treated Korean pine posts exposed to the weather,” Forest Prod. J. 50(2), 59-64. Flynn, K. A. (1995). “A review of the permeability, fluid flow, and anatomy of spruce (Picea spp. ),” Wood Fiber Sci. 27(3), 278-284. Islam, M. N., Ando, K., Yamauchi, H., Kamikawa, D., Harada, T., Khalil, H. P. S. A., and Hattori, N. (2014). “Impregnation of laser incised wood of Douglas fir and Japanese cedar by dipping (passive impregnation) in solutions of copper azole (CuAz-B) and a fire retardant (PPC),” Holzforschung 68(3): 353-360.DOI: 10.1515/hf-2013-0140. Kang, C. W., Shin, I. H., Kang, H. Y., Lee, Y. H., and Fujimoto, N. (2015). “Effects of HTLH and kerfing pretreatment on the drying characteristics of large square red pine timber,” Journal of the Faculty of Agriculture Kyushu University 60(2), 451-456. Kim, Y., and Park, S. (1991). “An anatomical research on liquid-penetration and penetration-path of wood,” J. Korean Wood Sci. Technol. 19(3), 7-18. KSF 2208 (2004). “Method of bending test of wood,” Korean Agency for Technology and Standard, Eumseong-gun, Chungcheongbuk-do, Korea. KSF 2206 (2004). “Method of compression test of wood,” Korean Agency for Technology and Standard, Eumseong-gun, Chungcheongbuk-do, Korea. Kumar, S., and Morrell, J. J. (1989). “Penetration and absorption of different CCA compositions in 6 western conifers,” Forest Products Journal 39(10), 19-24. Lee, N. H., and Shin, I. H. (2012). “Air circulating oven-drying characteristics of hollowed round-post for Korean main conifer species-Part 2: For Korean red Korean pine hollowed round-post,” J. Korean Wood Sci. Technol. 40(2), 61-70. Lee, N. H., and Shin, I. H. (2014). “Air circulating oven-drying characteristics of hollowed round-post for Korean main conifer species – Part 3: Effects of water-vapor dam and heartwood coating treatments,” J. Korean Wood Sci. Technol. 42(2), 101-111. Lee, N. H., Zhao, X. F., Shin, I. H., and Lee, C. J. (2012). “Air circulating oven-drying characteristics of hollowed round-post for Korean main conifer species – Part 1: For Korean red Korean pine hollowed round-post,” J. Korean Wood Sci. Technol. 40(1), 44-52. Lim, J., Oh, J. K., Yeo, H., and Lee, J. J. (2013). “Behavior of center-bored round timber beams in center-point bending test,” J. Wood Sci. 59(5), 389-395. Morrell, J. J., and Newbill, M. (1986). “Kerfing to prevent decay of Douglas-fir poles – An update,” Forest Products Journal 36(5), 46-48. Rice, W. R. (1996). “Longitudinal gas permeability measure from Eastern white pine, red spruce,” Wood Fiber Sci. 28(3), 301-308. Ruddick, J. N. R., and Ross, N. A. (1979). “Effect of kerfing on checking of untreated Douglas-fir pole sections,” Forest Products Journal 29(9), 27-30. Yeo, H., Eom, C. D., Smith, W. B., Shim, K. B., Han, Y., Park, J. H., Lee, D. S., Lee, H. W., Moon, J. P., and Park, J. S. (2007). “Effects of center boring and kerf treatment on kiln-drying of larch square and round timbers,” Forest Prod. J. 57(11), 85-92. Article submitted: November 8, 2016; Peer review completed: December 29, 2016; Revised version received and accepted; March 29, 2017; Published: April 6, 2017.